After the Olympics, Barcelona wanted to keep its economic momentum going by holding another exposition. They couldn't pull that off, so instead Mayor Maragall proposed something called a Universal Forum of Cultures, a whole year's worth of conventions, conferences and other events on the themes of peace, sustainable development and cultural diversity—a sort of world's fair for the righteous and worthy. The juiciest part of the plan, to the Catalan politicians, was that it gave them an excuse for another expensive building project. Hence the Fòrum, the brobdingnagian, triangular convention centre on stilts that stands next to the Diagonal Mar shopping mall. Barcelonans call this work of the Swiss architects Herzog and de Meuron the 'floating blue cheesecake'. Even in Barcelona the Forum is hard to beat for shameless look-at-me architecture. The cleverest stunt was the roof, covered with 40cm of water. This was supposed to keep the building cool, but a few months into the festival it started making big chunks of the ceiling fall down, one of many building problems that plagued the event. Held in 2004, the Forum of Cultures attracted celebrities from Mikhail Gorbachev to Angelina Jolie, but few regular folks. Barcelonans raised some shrill protests over its huge cost and grandiose pointlessness, while NGO's and anti-globalization groups around the world attacked the heavy corporate control of the event and its message. The highlight came in July, with a seaborne invasion of the Fòrum by hippie protesters on rafts. Barcelona wants nothing more than to forget the Fòrum's bizarre past. 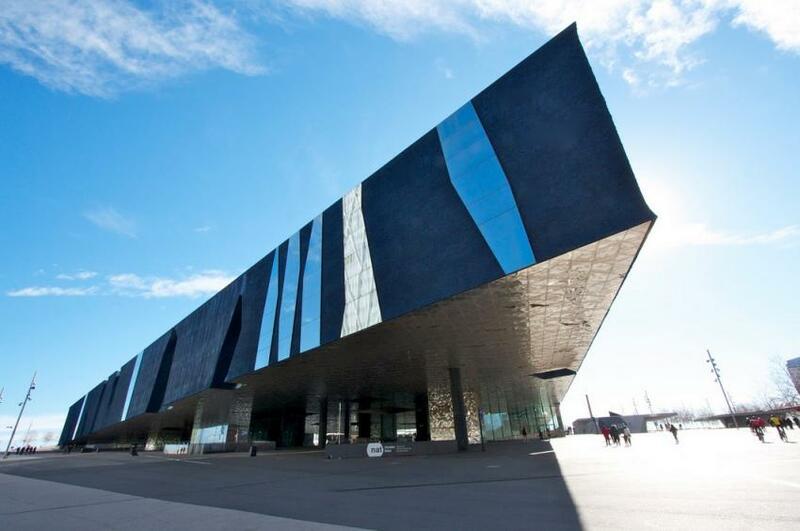 With a new roof, the building has been rebranded the Congress Centre Internacional Barcelona (CCBI), while part has been given over to the Museu Blau, dedicated to the sciences of nature. home of the Museu de Ciències Naturals. Some of its exhibits will still be in the original buildings in the Parc de la Ciutadela. The 'Blue Museum' in the very blue Forum opened in March 2011. The main exhibition, called 'Planet Life' has displays taking from the region's over three million mineralogy, petrology, palaeontology, zoology and botany specimens, with state of the art interactivity. There is also a 'Science Nest' for children 6 and under. The Parc del Fòrum outside hosts some of Barcelona's biggest concerts and events. There's also an enclosed sea swimming area here, the Banys Forum, and a fun fair with bumper cars; you can rent a kayak or go water-skiing nearby or play in an urban jungle gym. There's also a very useful long term car park.